Oooh, another guest post and today, it’s for Color Your Summer II, a series I LOVE and on one of my favorite blogs ever, Delia Creates. I feel very lucky to be a part of this fun series. Check out the full tutorial on Delia Creates and while you’re at it, you should take a look at all the colorful projects on both her site and at Kojo Designs. Hope you have a colorful and sunny weekend! This entry was posted in guest post and tagged color your summer, picnic blanket, quilt, yellow by Cherie. Bookmark the permalink. Thanks!! I wanted to use waterproof fabric too, but didn’t have time to find some good material. The only part that might not work though, is that you wouldn’t want to quilt with a waterproof fabric because putting all those little holes in it would let water through – that’s just my guess. But yes, a waterproof bottom would definitely be so handy! this is even better than your instagram preview!!!! omigosh. i love it. and thanks for the sweet words and the linkup – hooray for sunshine! Thanks for the inspiration and helpful tutorial!! Hooray for sunshine indeed – hope you’re soaking some up! I feel lucky to have you as my guest! Thanks Cherie! This quilt DOES scream summer. And now I’m craving watermelon. Love the design, so sunny & bright. Oh I am in love with this! 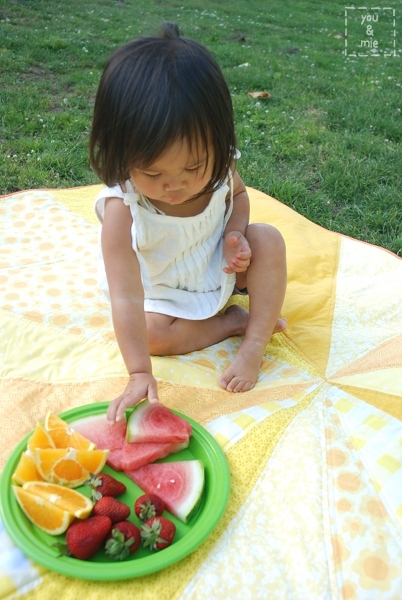 I am so inspired – it’s been years since I’ve quilted but I think the cuteness of this little picnic blanket just might be just the kick in the pants I needed to try it again! Reblogged this on Alex Gill Blog.